A Glendale - based Bloodring Banger in GTA San Andreas (PlayStation 2 version). The Bloodring Banger is a vehicle that is used in the Bloodring and Blood Bowl stadium challenges in Grand Theft Auto: Vice City and Grand Theft Auto: San Andreas, respectively. Bloodring Bangers are evidently vehicles modified for use in demolition derbies, and as such are stripped down with added safety features for the driver. The Bloodring Banger is originally available in GTA Vice City in the form of either a modified Glendale (internally named "bloodra") or Oceanic (internally named "bloodrb"); in GTA San Andreas, however, only the Glendale is used (despite the "bloodrb" handling line remaining in the GTA San Andreas game files). Cosmetic modifications of the Banger include roll bars (which varies depending on their car number) and netting for the driver's compartment for GTA Vice City, and roll bars and welded bars of metal in GTA San Andreas. Bloodring Bangers are only capable of seating two, unlike the Glendale and Oceanic, which both seat four. The GTA San Andreas rendition does not even feature opening doors; in CJ's entry animation, he climbs in through the window. Being vehicles outfitted for demolition derbies, Bangers typically feature unconventional color schemes, including some with checkered roofs. 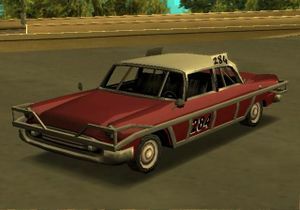 Another minor difference is the roof-mounted racing numbers on Bloodring Bangers in the PlayStation 2 and PC versions; while the PS2 version has scribbled numbers, the same signage is completely black in PC versions, likely a programming mistake during porting. While the GTA Vice City renditions of the Bloodring Banger sport well-known Vice City and Liberty City businesses as sponsors, GTA San Andreas' Bloodring Bangers do not feature any advertising. In GTA Vice City, the Glendale variant may spawn with the number 1, 3, 27, 53, 69, or 99. The Oceanic variant may spawn with the number 11, 41, 48, 59, 73, or 83. These numbered variants can be saved in save garages. Glendale-based Bloodring Banger in GTA Vice City (Rear quarter view). Oceanic variant of the Bloodring Banger in GTA Vice City (Rear quarter view). A Bloodring Banger in GTA San Andreas (PC version) (Rear quarter view). Note the blackened rooftop signs where written racing numbers are meant to be. Performance wise, the vehicles receive minor modifications. The car retains its rear-wheel drive configuration, but acceleration and speed for the car is very good, being much faster than the original Glendale and Oceanic. It has much tighter suspensions, which results in tighter cornering. The Oceanic Banger in GTA Vice City is lighter than the Oceanic, while the Glendale Banger is heavier than the Glendale. In GTA Vice City, Bloodring Bangers feature many businesses as sponsors and include many businesses that appear no where else in the game. This page was last modified on 23 July 2012, at 23:25.